Exercising can be a great way to get in some ‘me time’ but it’s also a great way to spend family time as well! If you’re looking for ways to spend time with your kids that doesn’t involve video games, spending tons of money, or even leaving your own front yard, check out these ideas. Relay races – alternate between running, wheelbarrows, skipping, hopping, etc. If it gets you moving, do it! Build an obstacle course – Check out Pinterest for different ideas. A quick search for kids obstacle course will give you a million options. You can make it as simple or as detailed as you want! Tag! There are many varieties to this game including freeze tag, turtle tag, or just regular old fashioned tag. It’s a great way to keep moving. Riding bikes (or scooters, skate boards or roller skates!) together. 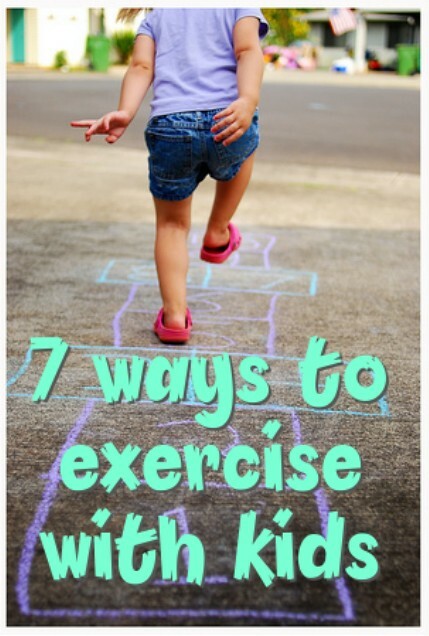 Hopscotch – Get some chalk and draw out a hopscotch, grab a rock or a bean bag and get hopping! This one is always fun no matter how old you are. Create a circuit workout using different stations. Set up hula hoops, jump ropes, even a mini trampoline if you have one. Set a timer and have each person do as many of each station as they can before the timer goes off and its time to switch. Just Dance! Ok, I know I said no video games but this would be the exception. Just Dance on Wii or XBox is a super fun, super active way to play with your kids and get some laughs! These are just a few ideas to get you started. There’s also basketball, soccer, swimming, going for walks…the possibilities are endless. The most important thing in choosing active games for you and your kids is having FUN. As long as everyone is moving and having a great time in the process, you’re winning. Now get outside and go play!